Our third day in San Francisco! Saturday was our third and final day in San Francisco, and many guests spent the day shopping, visiting Alcatraz, or touring independently. The “Hop On, Hop Off” bus made it so easy to travel around the city for sightseeing! A popular stop was Alamo Square, for a view of the famous Painted Lady houses! The well-known Haight-Ashbury district was so bustling and unique, you could easily spend an entire afternoon exploring it. The AIDS Memorial Grove in Golden Gate Park. From Haight-Ashbury, it’s easy to take a stroll through San Francisco’s beautiful Golden Gate Park. The park is huge, and features landmarks like a Japanese Tea Garden, the National AIDS Memorial Grove, and the California Academy of Sciences museum. 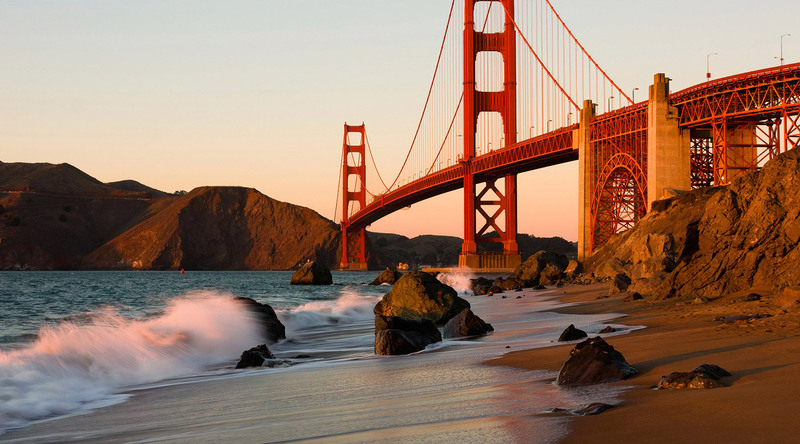 Of course, a visit to the Golden Gate Bridge is a must when you’re in San Francisco! It’s very easy to bicycle or walk across the bridge. Though it was chilly on the bridge, the spectacular views made it well worth the trip. Saturday was a great day to be in San Francisco, as a two-week long celebration of the Year of the Horse culminated in an amazing Chinese New Year Parade. The annual event is considered one of the top ten parades in the world, and is the largest of its kind outside of Asia. Back onboard the ship, many guests enjoyed a romantic dinner at the onboard specialty restaurants as the ship sailed out. Some guests braved the cold to see the great views of the Golden Gate Bridge was we departed – but they were kept warm and cozy with hot chocolate, rum and blankets. After an exciting three days and two nights, guests are ready to enjoy some sunshine and relaxation during a day at sea! As always, make sure you’re following us on Instagram and Twitter!